Dawn and Joe got married at The Glade in Rosliston. As soon as I first saw the wedding venue, I knew exactly the photo that I wanted to take here - the one that you see above. The photo itself, or at least the idea behind it was nothing new; the style of photo here is one that I've done many times before previously, albeit it at different wedding venues. 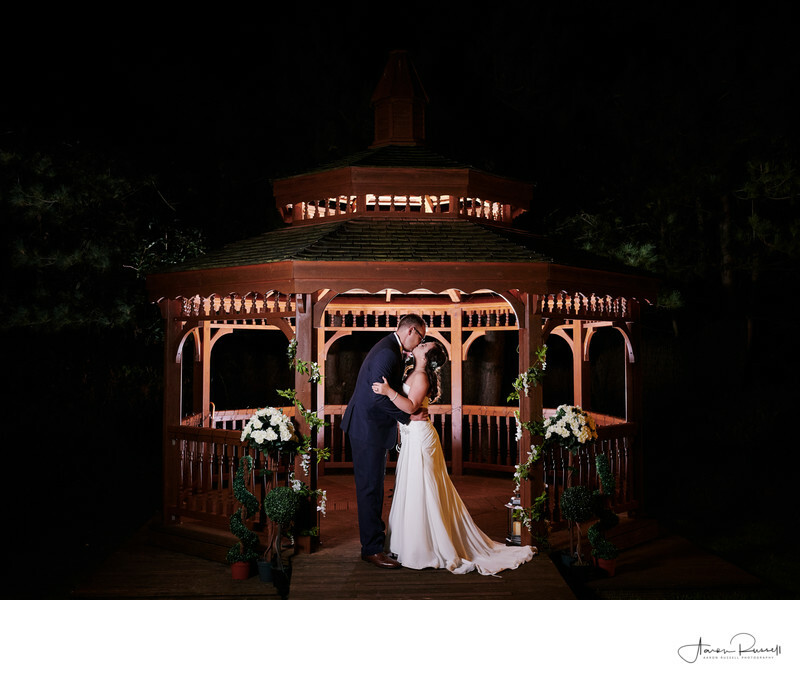 The idea is fairly simple - shoot a flash up into the ceiling of the feature of choice (whether it be a pergola, gazebo or stone arch the effect is the same) and expose for the flash using manual settings. The light shoots up, bounces off the white underside of the object and bounces in every direction. This provides beautiful lighting that wraps around the couple, as well as picking out all of the features of the thing they're standing under. That's how it usually goes... the underside of this pergola was made of wood, which itself was stained a rich reddish-brown colour. The bouncing flash comes back, tinted with the colour of the thing you shot it at. In this case, it meant that the returning light was a deep red hue. This wasn't the look I was going for - but it's ok, as I pre-empted this and instead moved the couple to the front of the structure. This meant that the light that was going up, becoming tinted red and coming back down, now, wasn't hitting them at all. What it did mean though was the bride and groom were now stood back in darkness. To counter this, and add a splash of magic to the image, I used a second light, outside of the wooden-structure, pointing back at the bride and groom. The effect is wonderful - the red/brown wooden structure is lit with a warm light, and the light hitting the bride and groom remains white, untouched and unaltered by the surroundings. With the camera's white balance corrected, you're left with the wood being cast with a deep earthy colour and the bride and groom looking exactly as they did on their wedding day.